One of the greatest minds of all time, the mind that explored the hidden corners of the universe, the mind that refused to find comfort in delusions even while suffering for over 55 years, has ceased to exist at the age of 76. He was the wheelchair scientist who prepared lectures just by twitching his cheek and the visionary physicist who modeled an expanding universe that is both bounded in space and unbounded in time while eliminating the god from his equations. 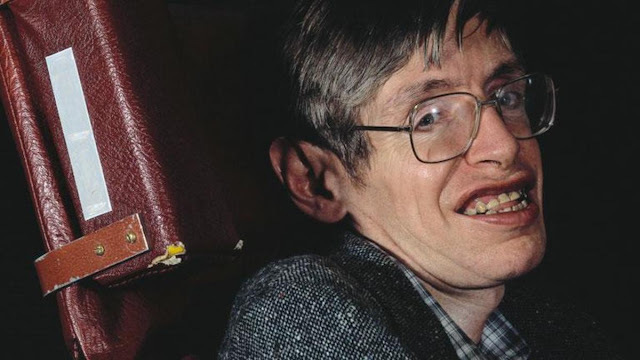 Just like the 11-dimensional string models founded on his theories, the multidimensional character of of Stephan Hawking ranged from a rebel who declined knighthood as a protest against the government’s limited science funding to the grown-child who went racing around in wheelchair, having fun in knocking off people. As an undergraduate in Oxford at the age of 17, he spent less than an hour per day studying. Due to his lazy studying patterns, he almost scored a second class and was then awarded a first class by the viva evaluaters who could see the genius behind his witty smile. He was also in the rowing team and was also interested in classical music and science fiction. It was Oxford where he became obsessed with black holes where space and time comes to a standstill, a passion that defined his career. Diagnosed at 21, the rare, slow form of ALS made hawking bound to a wheelchair for life and use various tools to communicate as disease progressed. In 2005, when he could click no more, he was attached to a device designed by Intel. This new device was a combination of a sensor attached to his glasses that reads his cheek movements to select letters and a word prediction system. He continued his academic work, preparing lectures at the rate of one word per minute and delivering them to the audience worldwide. Known as the Einstein of Black Hole Theory, Hawking’s work is both revolutionary as well as a perfect example for scientific thinking. He proposed that the entire universe could have started from a black hole singularity. Later in his life, he proposed the Hartle–Hawking state, thus proving himself wrong and showing that universe could be bounded while having no beginning, smoothing the singularity before big bang by modelling the universe with imaginary time. In this premise, asking “what was there before big bang” was like asking “what lies in the north of north pole?”. His willingness to admit mistakes and change opinion when sufficient evidence or reason is provided, is a valuable lesson to the mankind and a firsthand application of scientific thinking. Hawking radiation, the phenomenon that explains the evaporation of black holes with time and their eventual deaths, is considered as the crown jewel of his career and is about to be put on his tombstone at his request. Hawking was a man who “lived” his life to the fullest from a wheelchair, more cheerfully than most of us. He was known for his sharp wit and sense of humour that reflects in his lectures, books and answers to questions. In 2006, he participated in a zero-gravity flight in a free-falling aircraft and flew in a hot air balloon on the celebrations of his 60th birthday. In 2009, he threw a party for future time travelers to which, of course, nobody turned up. He started a bet with a physicist to be paid for subscription of an adult magazine in case if his black hole theory is proven wrong. Personally, his ‘A Brief History of Time’ and the corresponding series in Discovery Channel fueled my curiosity in cosmology, making me read about everything from strings to black holes to the entire universe. Through his cameo appearances in The Big Bang Theory (TBBT), Simpsons, Star Trek and Hitchhiker’s Guide to the Galaxy Radio Series, he captured the public interest as a pop icon for theoretical physics. Therefore, as an undergraduate in STEM field, Hawking’s books, thoughts and personal philosophy have been major factors that steered me towards the mysterious phenomena of the nature and the ways we can utilize them for the progress of mankind while living a cheerful personal life.